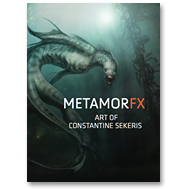 MetamorFX offers insight into Constantine Sekeris' aesthetic of creature design, makeup design, robot design, and costume design for film. As you flip through the pages, you will see it's a book about process from a rough, loose Post-it sketch, to a more refined, tighter rendering, into Photoshop, with photocollaging and detailing, to a rough ZBrush sculpture model. Chapter one on creatures will showcase examples of practical creatures with digital removal that allow the director and studio the option of having a creature that is designed as a practical suit or to be built completely digitally. The makeup chapter gives some tips as to what to think about when designing a practical makeup over an actor's face. Chapter three showcases robot design from the sci-fi look to the fantasy; covering the range of hard, sharp shapes to the soft and organic. The last chapter on costume design gives tips on what to think about when starting a costume over an actor and designing a complete digital suit. This book is also a look into what designing in the film industry is like. It's not only coming up with pretty images, but problem solving as well. Constantine has been fortunate to have worked with and learned from the best in the business and in this magnificent book, he is able to share tips from his artistic journey with you. Categories: Books, sorry you missed us // out of print. Tag: constantine sekers.